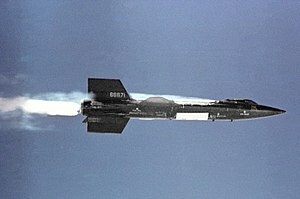 North American X-15 là một loại máy bay động cơ rocket của Không quân Hoa Kỳ và NASA. X-15 đạt vận tốc và độ cao kỷ lục vào đầu thập niên 1960. "SP-2000-4531: American X-Vehicles: An Inventory X-1 to X-50." NASA, June 2003. Davies, Mark. The Standard Handbook for Aeronautical and Astronautical Engineers. New York: McGraw-Hill Professional, 2003, First edition 2002. ISBN 978-0-07-136229-0. "Flight experience with shock impingement and interference heating on the X-15-2 research airplane 1968." NASA. Godwin, Robert, ed. X-15: The NASA Mission Reports. Burlington, Ontario: Apogee Books, 2001. ISBN 1-896522-65-3. Hallion, Dr. Richard P. "Saga of the Rocket Ships." AirEnthusiast Six, March–June 1978. Bromley, Kent, UK: Pilot Press Ltd.
Jenkins, Dennis R. Space Shuttle: The History of the National Space Transportation System: The First 100 Missions, 3rd edition. Stillwater, Minnesota: Voyageur Press, 2001. ISBN 0-9633974-5-1. Käsmann, Ferdinand C.W. "Die schnellsten Jets der Welt". Weltrekord-Flugzeuge [World Speed Record Aircraft] (in German). Kolpingring, Germany: Aviatic Verlag, 1999. ISBN 3-925505-26-1. "Thermal protection system X-15A-2 Design report." NASA report 1968 (PDF format). Thompson, Milton O. and Neil Armstrong. At the Edge of Space: The X-15 Flight Program. Washington, DC: Smithsonian Institution Press, 1992. ISBN 1-56098-107-5. Tregaskis, Richard. X-15 Diary: The Story of America's First Space Ship. Lincoln, Nebraska: iUniverse.com, 2000. ISBN 0-595-00250-1. "X-15 research results with a selected bibliography." NASA report (PDF format). "X-15: Extending the Frontiers of Flight." NASA (PDF format). "Proceedings of the X-15 First Flight 30th Anniversary Celebration, ngày 8 tháng 6 năm 1989"
Trang này được sửa đổi lần cuối vào ngày 2 tháng 4 năm 2017 lúc 07:52.